In a historic day for the long-in-development ATSC 3.0, at CES 2018 on Tuesday, the Advanced Television Systems Committee announced approval of the complete set of ATSC 3.0 next-gen TV-transmission standards. 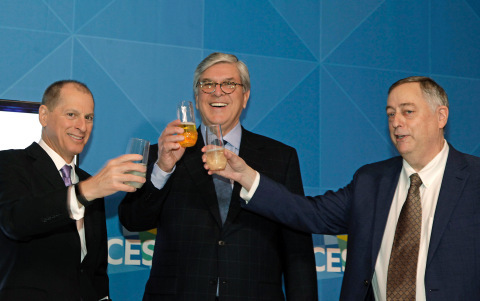 The announcement — made by ATSC President Mark Richer along with CTA President/CEO Gary Shapiro and NAB President/CEO Gordon Smith — marks the culmination of a five-year effort to develop what broadcasters hope will be the key to bringing over-the-air TV into the internet age. ATSC 3.0 provides broadcasters with increased flexibility and new market opportunities through enhanced transmission and reception functionality and delivery of 4K UHD, immersive audio, and interactive services using a mix of internet and broadcast connections. South Korean broadcasters have already initiated ATSC 3.0 for UHDTV broadcast service in the lead-up to the 2018 PyeongChang Olympics next month. The hope is that, with ATSC 3.0’s final approval, American broadcasters will not be far behind. The first trials of ATSC 3.0 services and products will begin later this year. He added that ATSC will continue to work on the standard, including its deployment in initial markets and future enhancements, and also will educate stakeholders about the new standard and assist them in implementation planning. In November, the FCC authorized broadcasters to begin over-the-air transmission of ATSC 3.0-based next-gen TV on a voluntary basis. Tuesday’s announcement marks the next step in the process, with selected broadcasters expected to begin trials in the coming months. Although ATSC 3.0-supported consumer products are not expected until 2019 or 2020, solutions are being demonstrated at CES 2018 in private suites and behind-the-scenes demonstrations.